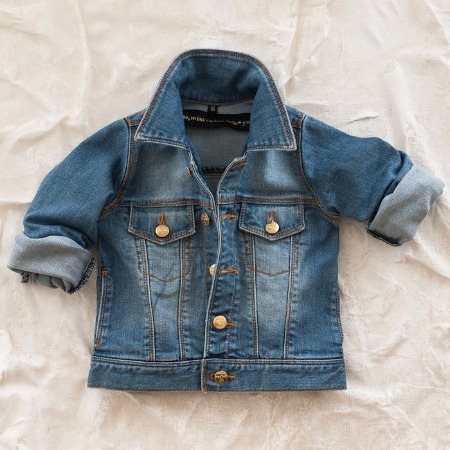 Denim Jacket… the First Thing to Buy Your Little One for Spring! The weather has been unseasonably warm in San Francisco, and I have been pulling out my favorite Denim Jacket to wear over everything. What can I say? My Denim Jacket is my "Go To" fashion piece, which I am happy to state it is not going away as a trend any time soon: with the 90's influence in fashion, Denim Jackets were evident this season on the runways and are sure to still be around next spring. Menswear designers worldwide have also been showing the Denim Jacket as the garment of choice for spring/ summer 2014. Denim Jackets are a UniSex Trend (Yippee!) and as you know, I Love UniSex Trends! 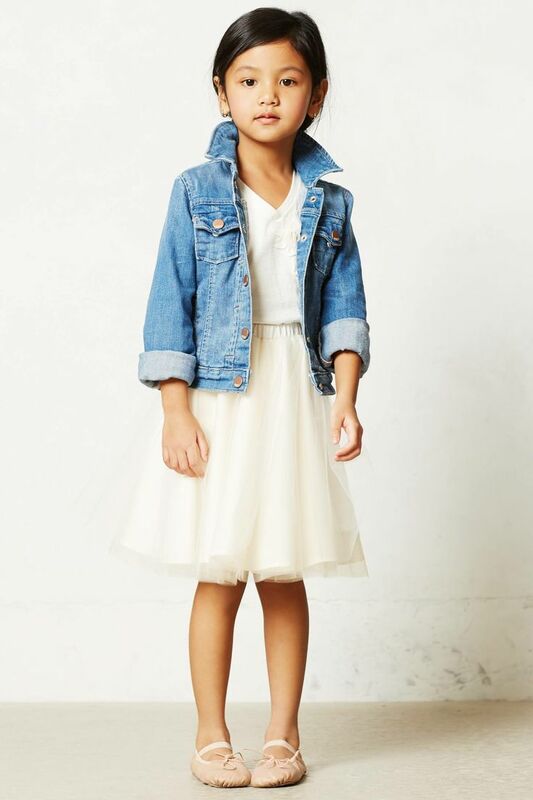 A Denim Jacket looks Adorable for a Girl over a Tee Shirt and worn with a Skirt (my favorites are Tutus!) and Ballet Flats, and it looks Cool for a Boy, also over a Tee Shirt and worn with Knit Pants (my favorites are Slouchy Sweatpants!) and Sneaks. For a Boy or a Girl, Denim Jackets can also be worn with Denim Jeans; the Denim on Denim trend can be worn light with light, dark with dark, or mixed and matched. The rules are that there are no rules and this is a trend with seemingly infinite possibilities. And another option for the Denim Jacket, is to wear it as a Cardigan while it is still cold outside; instead of wearing a knit sweater or sweatshirt over your child's outfit, try throwing on a Denim Jacket! Need I say more?... Make the Denim Jacket the First Thing to Buy Your Little One for Spring! This OshKosh B'Gosh Denim Jacket is the perfect UniSex Option for only $23.99. This is an amazing price for such a versatile Denim Jacket. There is nothing more Classic than a Levi's Denim Jacket. 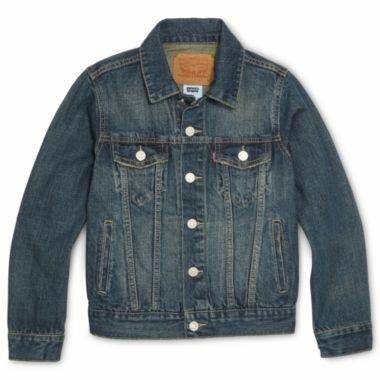 This Boys Levi's Denim Jacket would be just as cool on a Boy as on a Girl. See Above Photo of Denim Jacket worn with a Tutu (a Girls Denim Jacket does not need to be girly) in fact, it is cutest when it is classic worn with Girly Skirts and Graphics. If you are Looking for a Girly Denim Jacket option for your Daughter, this Scotch Shrunk Girl's Denim Jacket with Embroidery is a Cool Option. This Denim Jacket is an all-year-long favourite and features embroidered details on the front. It is made of Cotton & Elastane, giving it just enough comfort stretch to have a more Girly Fitted Shape. I am a Fan of Scotch Shrunk (especially their outerwear) their Girly Option, above, is perfect if you want a Girly Style for your Daughter, but if you are looking to get a jacket for your son or a Unisex option this Scotch Shrunk Denim Jacket is Very Cool! I Love the Fun Nautical Themed Printed Lining with Anchors, Compasses, and Waves...and as if that is not cute enough, it also has a small Painted Metal Fish above the Left Chest Pocket. 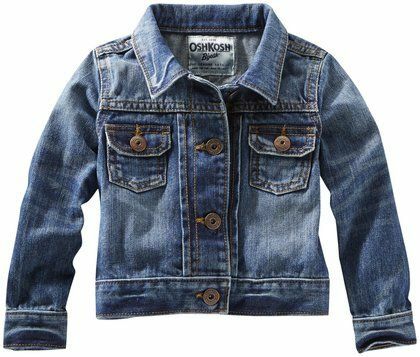 This Scotch Shrunk Denim Jacket has the Perfect Mix of Cool and Cute for your Little One! Another Brand I Love is Mini Rodini (Popular with Celebrity Moms and their Kids), if you want your Kid to look like a true Mini Rock Star this is the Denim Jacket for you. This Denim Jacket from Mini Rodini has an authentic Vintage Wash and when you buy this stylish Mini Rodini Classic Denim Jacket you get an Iron-On-Patch. Iron-on-Patches on Denim are very cool; your child can express his or her Loves, and the Patch Trend goes beyond Denim Jeans to Denim Jackets as well (DKNY had a patched Denim Jacket on their runway for Spring).